Showing results for tags 'purfling'. Just curious. Poor factory or something else? I paid only a few dollars for this when I was looking to try out a "baroque violin." Eventually got a good period instrument and this one now decorates a shelf at mom's. No corner blocks and at one time had painted purfling. So I don't expect this to be anything marginally decent. But I've always liked the looks of it. Just for the chance of an exception, I thought I'd ask Can anyone shed some light on the where, when, and why of this violin? Thank you ! Violin With Purfling Inlaid on Top of Edge? 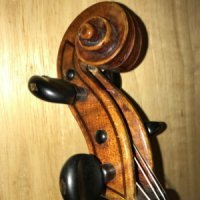 What would be recommended for fixing purfling that has not come completely detached but is clearly loose in the purfling channel on an old violin? So a friend of mine bought this violin at a small auction and got it for $70. He then decided he didn't really want it and gave it to me a few months later. Lucky Me! Well I restored it by removing the black patch of rosin build up and taking it to a luthier to have a few seams re-glued. After the restorations, the violin plays great and has a set of dominant strings on it which respond very well. (And yes, I know the images display D'addario prelude strings. I purchased the dominants a few months after these pictures were taken). I then had a conversation with my local luthier trying to determine the origin of this violin (The inside label says "Antonius Stradiuarius Cremonensis Faciebat Anno 1734" which gives me absolutely no info about this at all other than its a copy of a strad, just like millions of other violins on this planet). He told me that his first impression was that it was Chinese because of the varnish but because of the purflng, it seems French. However, the arching around the outside doesn't swoop down then back up like a typical French violin. We went on and talked about different features this violin has that pointed in completely different directions on the globe regarding its origin. I guess I'm just curious because this violin is not like any one I've seen before. Any opinions about anything would be greatly appreciated. Extra info: It has all 4 corner blocks (this is nothing like a mass-produced instrument from the 20's) There have been no cracks/repairs besides re-gluing seams The varnish looks exactly the same in real life as it does in the pictures (So there's nothing to worry about with poor color reproduction) If you want any higher res or cropped images to focus on certain details (Or even images of something I didn't take pictures of) feel free to ask, I can take pictures any time. I always feel determined to get the best picture of what I'm told to take a picture of so no need to worry about anything being out of focus, blurry, or having poor lighting. No longer relevant. This thread keeps getting mentioned out of context in other threads. Out of respect, I was going to take it down, but MN must not allow deleting old threads that one starts. So I am going to delete my comments. Thanks, everyone for your help and insight! No longer relevant. Thanks, everyone! How do you glue your purfling? Ok, so I'm cutting the slots for the purfling on my second violin and I wasn't happy with the amount of glue seep-age I got on my first. Seemed to make the varnish not want to stick to the edges. What technique do you use to glue purfling into its slot? There's a big difference in price when buying pre-made violin purfling for one instrument from a known supply company and buying 100 pieces from China for anywhere from $12 up. I'd like to have a batch on hand without paying an arm and a leg and I'm tempted to buy the inexpensive stuff. Are the inexpensive bulk lots a bad deal or not? And if they are, can anyone direct me to a good deal? I'm planning on viewing and possibly purchasing the violin pictured and am curious on whether anyone can tell me anything about it. The seller told me over the phone that there's a number written inside, but no label, and he can't see the number clearly. He found it in his deceased parents' closet when he was cleaning out the house and doesn't know anything about it. I thought the purfling work was unique and might be a clue in identifying it. Of course, the sound will make all the difference on whether I buy it (he wants $150), but it's always nice to know more about an instrument. The photos are from his online listing. Can anyone help me? Thanks!